Youth unemployment–and corresponding pessimism–is riding high in South Korea. Is precarity and uncertainty the new normal in South Korea’s labor market? If recent numbers on youth unemployment are any indication, then the answer is an unambiguous yes. According to the numbers reported by the Korea Herald, the number of unemployed 20-somethings in Korea currently sits at 410,000, up from 330,00 in 2013 (the highest it’s been since 2000). This should come as little surprise to those tracking the changes in post-1997 Korean society. In 1997, a confluence of most unfortunate factors, including the collapse of the won, ultimately led to a International Monetary Fund bailout package and the restructuring of South Korea’s economy (a restructuring which, to be fair, had been ongoing throughout the 1990s). There is life before 1997, and after. Indeed, an entirely new generation was founded by the economically debilitating, socially disruptive currency crisis that brought the South Korean economy to the brink – the 880,000 won generation. Economics professor Woo Suk-hoon coined the term in a 2007 book, The 880,000 Won Generation. The amount of 880,000 won (roughly $750) is about what a non-regular or contract worker can expect to make per month; the term embodies the lost of promise and progress and the financial insecurity of post-97 South Korea. While South Korea’s exporting behemoths – the chaebol – may have rebounded nicely from the crisis they partially helped create (South Korea’s conglomerates were highly leveraged and fiscally irresponsible pre-1997), Korean labor has – as labor often does – taken the hardest hit. High unemployment, or precarious employment (e.g., temporary/contract work), for 20-something-year-olds is the unsurprising outcome. But it isn’t just South Korea’s youth who are bearing the brunt of post-97 labor market changes. 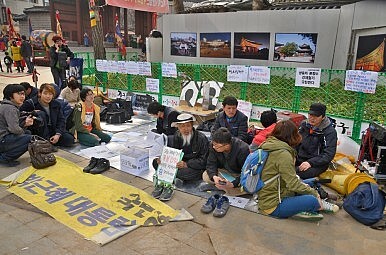 Laborers of all ages, particularly the relatively undereducated (by Korean standards), are feeling the downward pressure. The high-altitude sit-ins – long, often precarious, and certainly exhausting acts of protest – taking place across the country in protest of the spread of contract work (among other protests) shows that it isn’t only the recent college graduates that are feeling the pressure – it’s everyone with relatively little power resources. So while business may be good, it isn’t good for all. In other words, a rising tide doesn’t always lift all boats. Kim Jin-suk, the labor activist who spent nearly a year encamped atop a crane in protest of major layoffs, lamented in a recent tweet that “Korean workers have been tossed aside.” It is a sentiment shared by many. Can South Korea Jumpstart Job Creation? South Korea unveils its five-year plan for creating jobs, but will it be enough?